Events at the Austrian Cultural Forum are free, but seating is limited. Please visit our website for booking information. Basic structures of presents three artists that use the vocabulary of fabric within the development of their practice. Positioned within the frame of the London Fashion Week, this exhibition delves into the conceptualisation of trends, repetitive processes of production and human relationships to weave. The artworks will reflect on the connections between the body, technology and the inherent gestures that relate to construction of textiles. Participating artists include: Anna-Sophie Berger (A), Fay Nicolson (UK) and Constanze Schweiger (A). Curated by Hannah Conroy. Anna-Sophie Berger comes from a fashion background having studied fashion design at the University of Applied Arts in Vienna. She likes to work around the concept of limitation and simplifying clothes to a very basic shape. For her mainly black and white collection 'm/m2', Berger chose the square that was transformed and disrupted, before shown as an installation pinned to a wall to visualize the two dimensional aspects of the flat squares and contrasting that in the look book, when the model’s body wearing the clothes creates a three dimensional volume. Her artwork questions differing modes of production, distribution and value-attribution. She has mounted solo exhibitions at JTT and Ludlow 38 in New York; 21er Haus, 21er Raum, and Mauve in Vienna; and, most recently, White Flag Projects in Saint Louis. Basic structures of will be her first major group exhibition in London. She is an impressive artist having been featured in numerous international magazine and we hope this exhibition allows her to make further contacts in the UK. 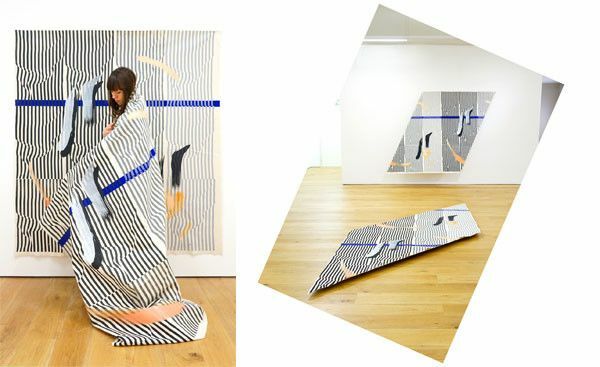 Fay Nicolson (b.1984 in the UK) traces relationships between form and content whilst investigating their connections between history and documentation. She also curates and writes and often collaborates with others to initiate dialogues and explore shared interests. Recent curatorial projects include; RE-RUN, curated with Majed Aslam, Banner Repeater and on-line @ www.re-run.net (2012); Performance Lecture, Royal College of Art, London (2010); Fictions, curated with Hugh Dichmont, Bonington Gallery, Nottingham (2009); and the forthcoming exhibition, Accidentally on Purpose, curated with Candice Jacobs at QUAD in Derby (July 2012). Fay writes for journals such as [a-n] magazine and Jan Mot Newspaper. Her text Never Odd or Even was published in Issue 1 of the independent art journal A Circular July 2010. Fay completed an MA from the Royal College of Art in 2011 and is based in London and the East Midlands, UK. Constanze Schweiger’s work combines text and textile while circling the aesthetics of art and fashion and society. She takes excerpts and elements from her blog and transforms them into exhibition works. Texts become prints, ornamental scrolls which combine text and abstract forms. Constanze’s blog is an important part of her artistic practice. It features a combination of curatorial texts, some from exhibitions in which she features, to artist’s statements, historical artist texts and poetry. By transforming blogtexts into objects she creates what she calls a ‘metaornament’. Constanze has created a new scrollwork for the ACF London exhibition. Constanze Schweiger lives and works in Vienna. Her works have been featured in numberous art venues in Austria including ‚bei school, Wien (2012), Museum der Moderne Mönchsberg, Salzburg (2012), Kunstraum Niederösterreich, Wien (2011), Ve.Sch, Wien (2011) und Magazin, Wien (2010). This will be her first exhibition in the UK.